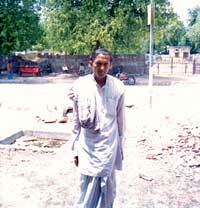 For the last three decades, the villagers of Karauli district in Rajasthan had grown accustomed to listening to the blasts of mines. And worse, to having their fields rendered useless for cultivation. With illegal miners clearing large tracts of land, and using dynamites for creating quarries, agriculture is no longer possible in a majority of these areas. Another fallout of this activity has been the increasing number of casualty among the livestock. There have been numerous instances of cattle being killed due to gases released during mining blasts. A large number of people are reportedly suffering from tuberculosis on account of this activity. Unfortunately, these villagers have few options today. Either they migrate, or get involved in the business of mining sandstone, and further deteriorate the land condition. Those working as labourers in these mines are completely under the control of the strong mining lobby. But now, 46-year-old Bhagwati Lal Meena, sarpanch of the Gubraida gram panchayat is attempting to bring illegal mining to a halt by providing a forum for farmers to voice their concerns. The very fact that he won the panchayat election, with removal of these mines as his main agenda, speaks for itself. His fight, however, is against illegal mining, and not over plots of revenue wasteland that the department of mining has leased out. Out of a total of 118 hectares (ha) of gauchar (pastureland) in Kasara village, coming under Gubraida gram panchayat, around 7.5 ha is laid waste because of accumulation of trash emanating from the quarries. In March 2000, with the backing of the villagefolk, he filed a case in the district court against the mining department and the district collector for trying to lease out plots on the gauchar. Even though the mining department tried its best to secure the court verdict in its favour by contending that the government stood to lose out on revenue if the land was not leased out for mining, the case was ultimately resolved in favour of the panchayat. However, Bhagwati is not resting on his laurels. His next fight is against illegal mining in forestland. The gauchar victory was easy because the pastureland came under the purview of the panchayat. The case of forests, though, is entirely different. Although they fall under the forest department, these forests have gone unprotected. Laxman Singh, district forest official in charge of the area, justifies the department's inaction saying that the problem is present throughout the area, with Gubraida being only one of many such cases. According to Arun Jindal, director, Society for Sustainable Development, Karauli, the mining lobby is strong, and the government bodies are not strong enough to control them. Atul Sharma, district collector, Karauli, says, "This department is hand-in-glove with the miners." Villagers also complain that many of their representatives in joint forest management (jfm) are in league with the miners. Bhagwati hopes to stop this trend by forming a new committee, which is better tuned to the needs of the farmers. The villagers feel that once they are given the power to fine those who carry out mining, they would be in a better position to control the activity. This may be difficult in a situation where a large part of the population depends on mines for sustenance. Ganpati Lal Meena, whose father previously headed the jfm committee, (and has been blamed for aiding illegal mining) says that mining is the only means of sustenance for the locals, as the forest and agricultural lands have been destroyed. The path ahead is difficult, as the money needed for fighting the case and the paperwork has to be given by the poor villages themselves. Moreover, the powerful mining lobby terrorises people who support Bhagwati and gets them jailed on cooked-up cases. Even Bhagwati's brother and son have been implicated in false cases. These liabilities notwithstanding, Bhagwati is going ahead with his crusade against the miners, as the returns are immense. Already, green patches are in evidence in these areas, and the cattle are better-fed as a result of the land rejuvenation.